Three new characters for The Dronescourge Returns campaign and a new foe: Concord NuHu Intelligence Mandarin Jai Galeyous and her panhuman, Vyess bodyguards; Privateer ‘Admiral’ Taras Kalemon and his Boromite and Freeborn bodyguard; Ghar Exile Commander Shaltok; and the command drone of the Dronescourge hive, a Virai First Instance. The IMTels of both the Isorian Senatex and Panhuman Concord are deeply alarmed. Along the Northern Interface border between the two great Antarean nations, whole star systems are dead or dying, their inhabitants and nanospore wiped up by… what? A resurgence of the Chryseis shard? Ruptions in the Nexus caused by the events of the Xilos collapse? Both nations send their top local operatives to investigate: for the Isorians, it is wily Drone Commander Xan Tu; for the Concord, the NuHu Intelligence Mandarin Jai Galeyous. The source of the devastation appears to be the wreck of a vast, ancient starliner in the newly-emerged system of Taskarr. 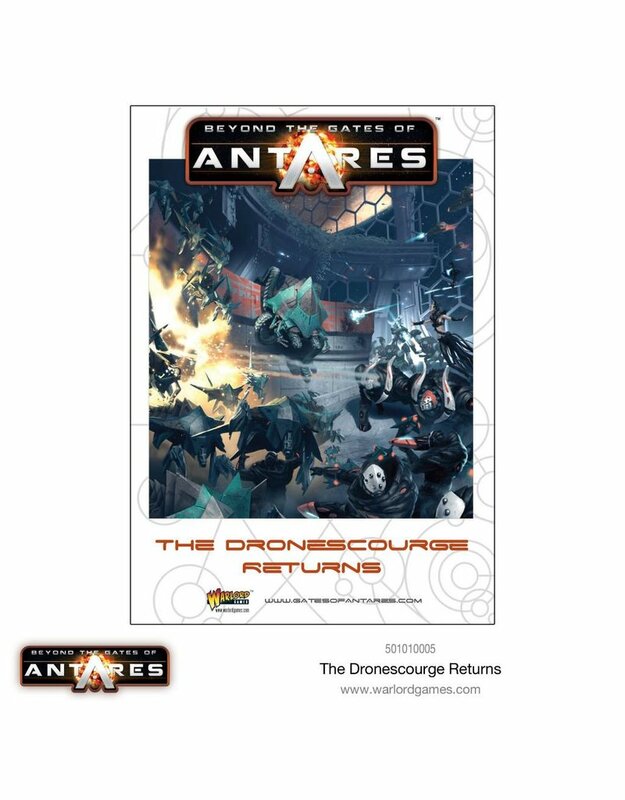 Their investigations are compromised by the presence of a fleet of Privateers and an army of exiled Ghar living on the ship, but what they discover is worse than they could have imagined, the resurgence of a deadly, ancient threat, one thought long-since destroyed – the Virai Dronescourge. 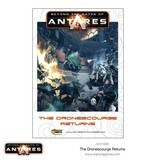 The Dronescourge Returns is a complete campaign supplement for the Beyond the Gates of Antares game. Focusing on forces from the PanHuman Concord and Isorian Senatex, it also includes the new forces of the Ghar Exiles and the Freeborn/Boromite Privateers. The campaign can also be played with any forces or combination of forces that the participants wish to use.